Ever wanted to be a minister but didn't want to wait or go through those years and years of boring old professors giving you the same boring old lectures? Well you are in luck. 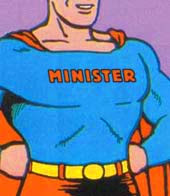 Through the modern advances in technology you can become a minister hassle free and no questions asked. You thought the catholic priest scandal was bad? Just wait till we are done. Your religion not listed? That's ok. Feel free to pick a new one from any of the ones below. Not sure which to choose? Just become a minister at all of them! This is sad there there are places that really give instant ordination.